The last time I was in the same room with Sauti Sol, was in June 2013. The middle of the night. Mount Kenya University’s fresher’s night. Thika. I don’t exactly want to remember that night. And I’m sure neither does the band. The whole event was a disaster. They, including Eric Omondi and M.O.G. were made to sit on these tiny, plastic chairs that make you feel every bone in your body. And they were in a tent stepping on soil under their Converse shoes. Not even palm leaves were placed under their feet like it was done for Jesus. They were crammed into that suffocated space with a bunch of groupies sneaking into their space for a picture. It was hot in there, and they were just too polite to complain. This was when Still the One had been released and all the girls in the country were brandishing their bras and knickers with excitement. There were cameras flashing all around in that stuffy ‘VIP Tent’. Even my own cameraman, to my surprise, turned out to be a groupie. He was all over the place, acquiescing to girls pulling him left-right to take a picture with the band. He left me solo with my broken recorder, having to take notes on this worn out notepad I had been carrying around for back up. Half the time I didn’t know what I was even writing in that thing, the lighting was horrible. There I was looking up to Baraza, literally – the guy is tall – craning my neck and standing on my toes to at least reach his waist during my interview, competing with a group of girls cursing me at the corner. They wanted to get into his trench coat and be carried home. Mudigi was crouched into his small plastic chair, all his attention on his phone, probably asking his lawyer to print out his Will in case the chaos in there hit the roof and he got buried in a stampede. I mean, it was noisy and hot. Smells of all sorts attacking your nose. It felt like a scene from Shameless. Polycarp was seated quietly, he’s the calm one in the band, adjusting his bum every time the uncomfortable chair felt like it had stiffened a bone in his spine. Chimano was standing alone close to the entrance, unnoticed, I don’t really know why. Could be the heat, or his height. That place did not feel VIP at all. I felt like my PRESS nametag meant nothing at all in there. I could easily be confused with a groupie if Polycarp hadn’t said to me: “Bro, you are wearing a kangol just like mine.” Then he saw the PRESS nametag hanging from my neck like in Django Unchained. I’m not exactly the coolest guy in the world to talk to, but the guy looked relieved. So the commotion kept spiking up in there. The bouncers at the door were sucking up to more girls and letting them in uncontrolled. They just kept pouring in. It became scary. All those girls, and just a few guys – even a blue pill couldn’t keep us up all night. If Cinderella’s shoe slipped off in the crowd, she couldn’t bend to pick it up. You couldn’t even keep track of your own hands in that space, because everyone’s hand was rubbing against yours. Sweat and stenches. Then there was a moment where we all couldn’t breathe in there. It was like a movie. Gaps in your memory. And the next thing we know there were screams and wailing outside. The stage went dead silent in a second. What on earth was going on? Then someone came running into the tent, panting like crazy, and he called out that Chimano was outside, being beaten by one of the bouncers because he confused Chimano for a groupie. The guy had just gone out for air obviously, but there he was, bleeding from his nose and his lip split. He couldn’t even stay standing, he was falling over, when Baraza came out of nowhere, going all Jet-Li on that stupid bouncer. Fly Kicks. Upper cuts. One. Two. Three. And all the other three band members joined in the fight. It was a terrible thing to watch, man. But some intervention came just in time to stop the mess. They couldn’t perform. They left angry and inconsolable. Drove off in their car and left disappointed fans behind. That was two years ago, when Sauti Sol were treated like just another name on the performers list. But who they are today is a far cry from the guys gasping for air in a tent. Twenty award winnings, twenty-six Nominations and Three albums later, they are practically quaking up the continent. Their latest album, Live and Die in Afrika, is a perfect demonstration of the band’s musical maturity from being just a couple of dudes singing about the bliss of warm weather in Sunny Days to making bold socio-political statements in Nerea. From the very moment you hit play on the first song, you can feel the excellence and perfection taking you over. You won’t find a single boring track in the album, unlike in the previous two, that had some songs not everyone could relate to. 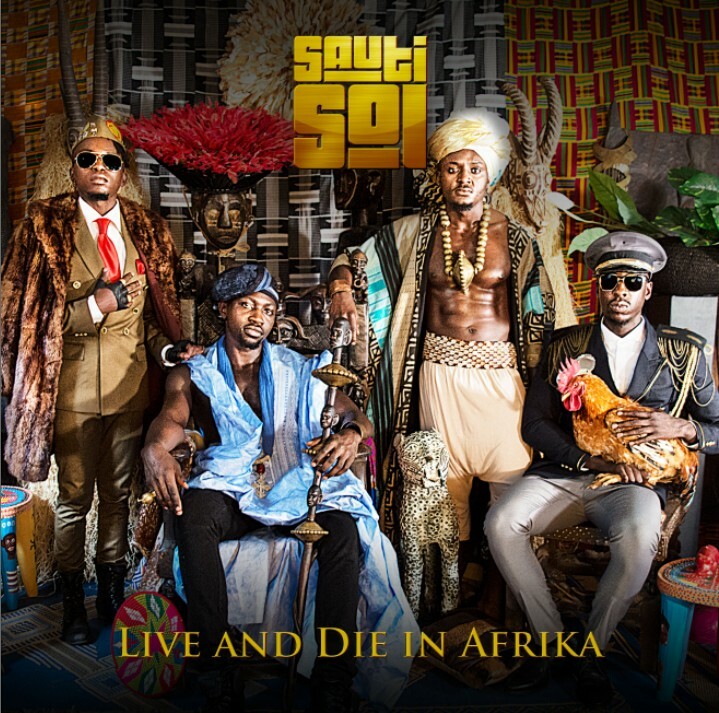 Live and Die in Afrika is a collage of emotion, expressed in simple but powerful lyrics, and has not been defiled with pretentious representations of the band’s life experiences, like some of our artistes like to do. They have managed to maintain their creative brand as musical storytellers and still grow both in musical and lyrical sense. They collaborated with the magical musical prowess of band members Polycarp Otieno & Bien-Aime Baraza, Andrew Ngatia, Cedric Kadenyi, Benjamin Kabaseke, Isaac Mugunda, Aaron Rimbui, Idd, Muli,Tito Monako, Aaron Rimbui and the background vocal contributions of Lydia Ndwiga, Benjamin Webi and Naema Murindi. The cover album arts, which have been the centre of so much speculation and anxiety in the last few weeks, are rich with eclectic photographic composition and an African rawness that lives up to the title of the album as well as the nature of the stories it aims to communicate. It’s a beautiful conceptualization of the continent’s cultural diversity; from Baraza looking like a no nonsense African ruler with an obsessive military grasp on his territory, still holding his beloved chicken that had him ditched in the comical scene from the Range Rover video; to Mudigi showing off the results of time-well-spent in the gym dressed as a North African prince, with the traditional kohl make-up decorating his eyes and the turban around his head. What still has many people scratching their heads though, is why they allowed fans to download the album for free from their website. All fifteen tracks. Unless, of course, there is a deluxe version we will have to pay for later. Otherwise, they might have to rely heavily on concerts to make up for the financial loss definite to be suffered. There are some horribly excellent pirates out there, and the free release will most likely end up being shared illegally on torrent sites and other means. All the same, Live and Die in Afrika is the kind of album you can never tire of listening to. Its stupendous rawness and virtuoso has set a new bar for both East African and African artistes in general, to match up to. Hanafi Kaka is also our resident music writer. (I’ve always wanted to write that). Sigh Biko where the hell are you? Chocolate man where are you??? Hanafi! You meet a guy one day and he pops into your email the next….. Excellent piece. Lovely read. Lovely… I want this one every week. You got to appreciate the art people or literature if you may call it! And embrace change. This is an absolutely great review Hanafi, also, your writing is brilliant. Live and Die in Africa is really a masterpiece! I don’t agree at all about this album. I am quite disappointed about ‘live and Die in Afrika’. Why? I think there is something missing in the song… What? I would say the chorus in swahili or sth else…! The album is a flop for me! sorry guys… They could do better! BIKO WHERE ARE YOU??????????????? Someone knows how to tell a story! Great writing. The intro is off the chains! Proud of Delvo (Mudigi) for finally growing into his producer element for this record. FYI, the free download wasn’t ‘free’ for them, it was covered financially by a certain big telco = making sales even before a copy was copped. Basically Kenya’s version of the Jay-Z / Samsung deal. So they made more bank that way than they’d ever do, selling album copies (which never makes much by the way, even for guys like them). Hanafi,’nough said.You are a good storyteller. This guys are good,but its becoming difficult to read once we realise its not you. Bikoo..??? Lovely read Hanafi, and I completely agree on your review of the Sauti Sol album Life and Die in Africa its perfection!! Excellent writing Hanafi, I like! Hanafi Kaka you are a great storyteller. I had fun reading all it. Where are your stories Biko? Wanjiku, thank you! You yanked the words off my throat. Let us encourage the budding writers. They need to find a voice, and we can at least provide the audience, yes? Wanjiku, thank you for writing exactly what was running through my mind.If you cannot read something written by someone else, write your own blog!!! Its Biko’s blog, he hosts those that please him. Hanafi, your writing is great. Thank you Wanjiku. I actually enjoyed reading this piece – as I have all the other budding writers. Don’t know what people are gripping about, but such is life! The point is, this is Biko’s blog. That’s what we signed up for. It’s like gong to see a consultant physician and he’s left interns at his clinic. They may treat your condition but you want the assurance of the consultant. Biko’s blog so he can do whatever he wants here. You dont like it there are other blogs and I believe you can also create one. Would love to critique it once its done so keep us posted on that. thank you Wanjiku, enough said! Wow this was worth my time! A good read! It was free, but Safaricom compensated them in exchange for the huge data consumption they were sure of getting. great read…proud of you Hanafi and those complaining we are still waiting to see what you can put together. Hanafi kaka is great story teller. great read…proud of you Hanafi and those complaining we are still waiting to see what you can put together. Hanafi kaka is a great story teller. Good read Hanaffi…worth reading every week. Hilarious just like Biko “Mudigi was crouched into his small plastic chair, all his attention on his phone, probably asking his lawyer to print out his Will in case the chaos in there hit the roof and he got buried in a stampede.” LOL! Thumbs up!! Good read… Finally a resident music writer for the music lovers. I love Isabella especially. Good song. Great piece resident music writer. Thumbs up. nice read hanafi. i like you more everytime you write. Biko honey, is it that time of the month? Worry not dear it will pass, it always does. I like this Hanafi guy already! Seamless flow,excellent diction. I wouldn’t ask for more! Keep it up. You gonna be the next big thing. I nearly suffocated in that tent along with you. Great writing Hanafi. Hanafi, you write well. You will soon get there. Hanafi the first time I read your post -about tech stuff-I didn’t understand half the content…but this! well done!! Wow….this is a great read….i saw the fists flying. Biko will be back. Lets support the upcoming writers. See what happens when you get of that blunt to talk to the gang. I dont know about the diplomacy in the comments but to me this was funny like reaaaally funny …..